We rely on Earth for valuable resources such as soil, water, metals, industrial minerals, and energy, and we need to know how to find these resources and exploit them sustainably. We can study rocks and the fossils they contain to understand the evolution of our environment and the life within it. We can learn to minimize our risks from earthquakes, volcanoes, slope failures, and damaging storms. We can learn how and why Earth’s climate has changed in the past, and use that knowledge to understand both natural and human-caused climate change. We can recognize how our activities have altered the environment in many ways and the climate in increasingly serious ways, and how to avoid more severe changes in the future. We can use our knowledge of Earth to understand other planets in our solar system, as well as those around distant stars. An example of the importance of geological studies for minimizing risks to the public is illustrated in Figure 1.2. This is a slope failure that took place in January 2005 in the Riverside Drive area of North Vancouver. The steep bank beneath the house shown gave way, and a slurry of mud and sand flowed down, destroying another house below and killing one person. This event took place following a heavy rainfall, which is a common occurrence in southwestern B.C. in the winter. 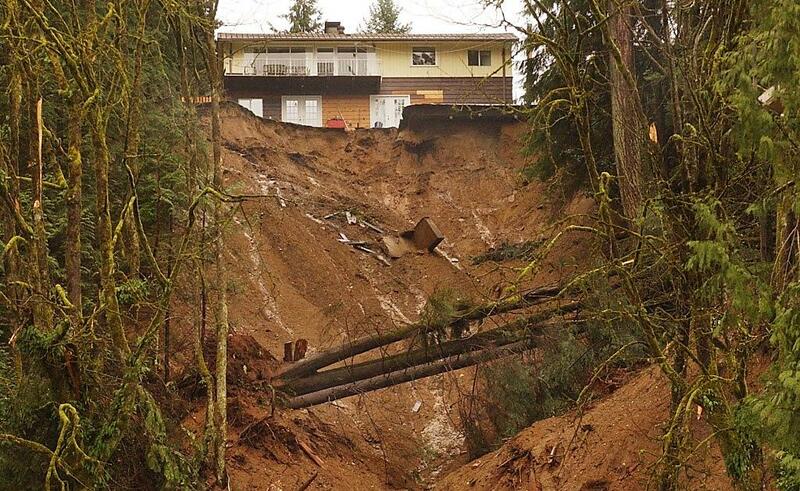 The irony of the 2005 slope failure is that the District of North Vancouver had been warned in a geological report written in 1980 that this area was prone to slope failure and that steps should be taken to minimize the risk to residents. Very little was done in the intervening 25 years, and the results were deadly. Previous: 1.1 What Is Geology? Next: 1.3 What Do Geologists Do? 1.2 Why Study Earth? by Steven Earle is licensed under a Creative Commons Attribution 4.0 International License, except where otherwise noted.